A year-long Self-Reliance roadshow exhibition that travelled around all seven wards within the Nottingham Stake ended in December 2016 having had 250 visitors, representing one-third of the Stake’s active membership. President Jonathan Gray, the Nottingham Stake President explained: “Because of the large area of the Stake, rather than expect members from afar to come to the Self-Reliance Centre to learn about self-reliance, we decided to take self-reliance to the members in their own ward buildings. 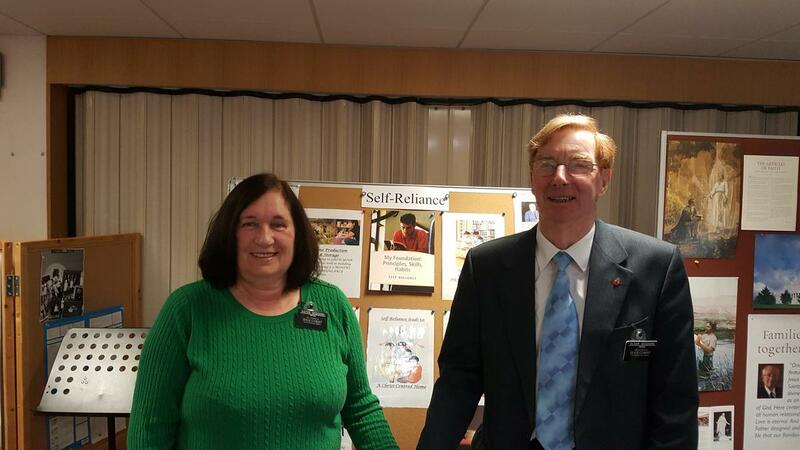 Elder Ken and Sister Patricia Goddard, the Stake Self-Reliance Specialists, who are serving a three-year part-time Welfare mission within the Stake, were asked to organise and direct the roadshows”. Elder Goddard added: “As well as gaining knowledge about all six areas of self-reliance, visitors were given handouts in each department and a booklet summarising what they had learned together and matching scriptural references to enable them to continue to discuss self-reliance issues in their homes during Family Home Evenings”. Those attending the roadshows signed a visitor’s book in which they wrote their comments and feelings about the event. Here is a sample of their comments – “Fabulous, brilliant, wonderful and very informative, excellent presentation and very enlightening and enriching”. As one of the objectives of the roadshows was to engender changes in peoples’ lives, there was a column in the visitors’ book to allow people to state one thing they intended to do as a result of their visit. Home production and storage featured most, followed by writing of journals, making wills, having a healthier lifestyle, better financial management and improving spirituality.